One thing I see a lot of on social media from beer snobs is their hatred of pumpkin ales, they love to hate them! Well, a lot of people hate the trend of pumpkin spice. Well, aside from Fort Garry’s Happy Jack Pumpkin Ale that I reviewed just last week - pumpkin beers are on the way out to make room for some new treats! The folks over at Lake of Bays Brewing out of Baysville, Ontario (Muskoka area) are excited about the Grey Cup coming to Winnipeg so they introduced the Chris Walby Pigskin Pilsner, which sounds as Winnipeg as a Muskoka beer can get (sorry, Farmery!) It retails for $15.89 per 1.89 growler and is only available at the 10th & Victoria Liquor Mart locally. The folks over at Craft Beer Importers Canada are bringing out their popular beer advent calendar sometime in the near future. The advent calendar retails for $133 and features a unique selection of twenty four different beers from all over North America. Last year had some interesting beers, including a beer from Nøgne Ø out of Norway. The price is a bit too much for me so I don’t think I’ll buy it this year, but you should expect a few other breweries to come out with their own beer advent calendars soon as well. Lastly, have you tried Wisers Hopped Whisky yet? What are you talking about Cody.. Wisers doesn’t make beer? Of course they don’t but they just released a new whisky that infuses notes of hops and malt to give it a bit of a dark ale vibe to it. I’ve reviewed several beers that incorporate whisky or their barrels before, so it’s pretty cool to see Wisers come out with a product influenced by beers. I wonder what a beer aged in one of those barrels would taste like? You can find this at Liquor Marts in Brandon, Minnedosa, Neepawa, Roblin and Virden for $27.99 per 750mL bottle. The newest treat at the Liquor Mart that I can’t stop buying is Unibroue’s La Résolution dark ale. 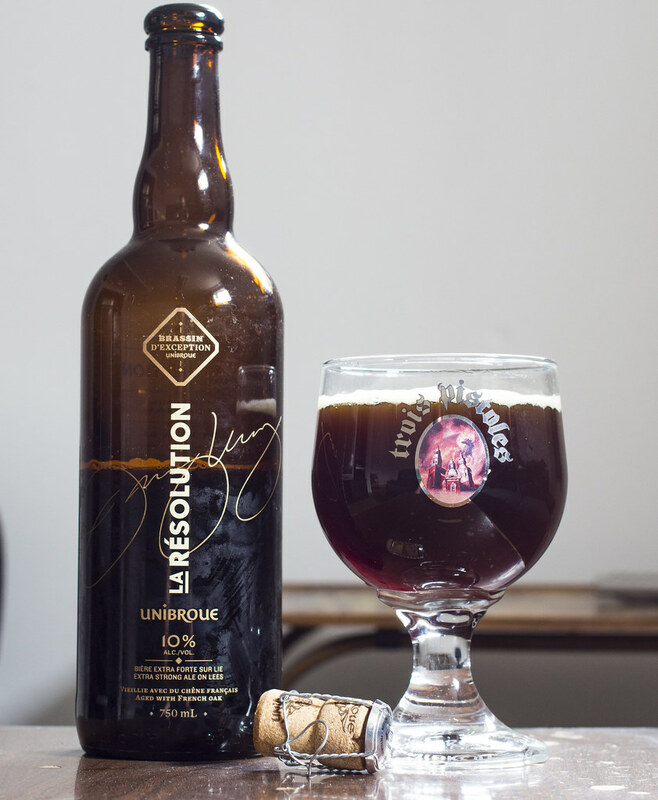 It was around this time last year when Unibroue’s La Résolution made its debut and somehow Liquor Marts got their hands on bottles before many dépanneurs in Montreal did! As soon as I tried my first bottle, I did a special order for an entire case (12 x 750mL bottles) because I assumed that this beer would sell off the shelves and never appear ever again, which is the norm for seasonal beers here in Brandon. Thankfully the beer was still around for a few months so I got to enjoy it over Christmas and New Years, but as well - I was able to age a bunch of it because Unibroue’s dark ales are constantly evolving in the corked bottles, so in four years time, it will be a great treat at Christmas time! La Résolution tops out at a whopping 10% ABV, making it one of the stronger beers at the LC. It pours a rich, muddy, brown ale with a hint of a reddish hue to it. It’s incredibly carbonated so I recommend chilling this for at least an hour. It has a good amount of light beige froth on top going nowhere. The aroma is reminiscent to Unibroue’s Trois Pistoles, which if you have ever tried - it has a sweet, dark chocolate and dark fruit aroma to it with a touch of alcohol. Trois Pistoles is simply hard to explain to someone if the strongest beer they’ve ever had was Shock Top, it’s an experience itself. After the Trois Pistoles-style aromas, I find a bit of a Belgian yeastiness that you tend to see in every Unibroue beer ever made. The aromas that really pop out is the whiff of cinnamon and nutmeg - but not in the pumpkin sense as in this beer is as far away from a pumpkin ale as they get. Light amounts of brown sugar and a hint of pepper spiciness are always present. For taste, the first impression I get is cinnamon, nutmeg, roasted malt followed by brown sugar, a bit of chocolate, lots of presence of dark fruits like raisins, plums, figs and dates. It’s creamy on the tongue and leaves a bit of an aftertaste of dark fruit and cream. This is not a beer I recommend drinking by yourself, especially if you just recently started buying craft beer for the first time. Frankly, I recommend sharing this with 3-5 of your friends and family because a 750mL bottle may end up being a bottle drain if you aren’t accustomed to heavier darker ales, especially Belgian-style ones like La Résolution. I remember trying Unibroue’s heavier ales back in 2004 and I had a hard time stomaching them because they were simply too heavy. So share this with friends and family! I recommend sampling this with a homemade poutine (fresh curds are mandatory) on a chilly evening when the Jets (or Habs) or Wheat Kings aren’t playing. To me, this beer reminds me of a combination of Unibroue’s popular Trois Pistoles meets their Unibroue 17 Grande Réserve, but with less oakiness. You can find La Résolution at the Corral Centre and 10th & Victoria Liquor Marts for $6.15 per 750mL bottle. Age this if you can! My resolution for 2016: to start making friends in this town!